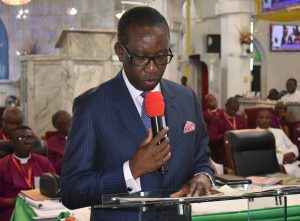 The State Governor, Sir Dr. Arthur Ifeanyi Okowa and his wife Dame Edith Okowa came to grace the Church of Nigeria (Anglican Communion) opening ceremony of the Standing Committee meeting Wednesday 6 February, 2019. The event sheduled for Monday 4th to Friday 8th February, 2019 at the Cathedral of St. Andrew has kept the Warri City agog. 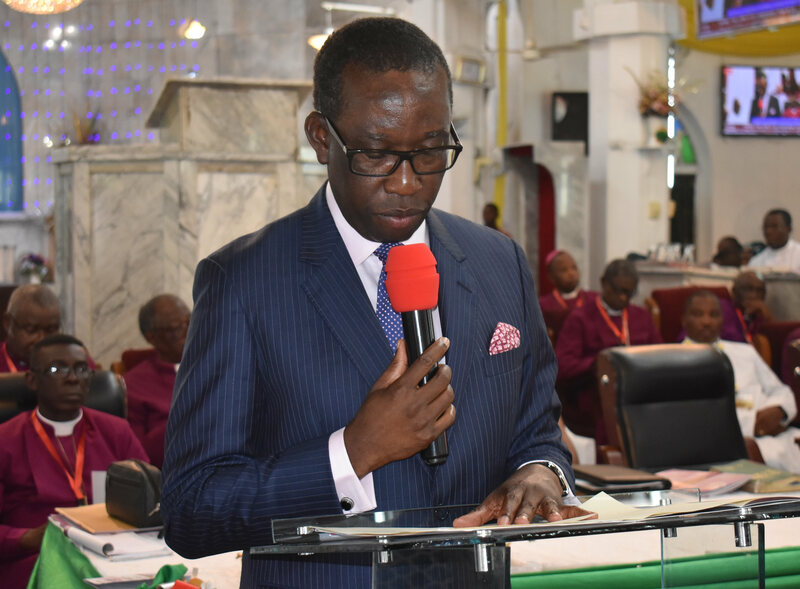 In his welcome address to all the delegates from the Anglican Churches all over Nigeria and North America he counted it as privilege to be part of the Conference. He said the theme of the meeting: “The Lord is my Shepherd” by King David expresses his (David’s) trust and love for confidence in God. The Governor stated that ‘We are totally dependent on God. quoting from John 10:10, 11, 14; Luke 15 and Daniel the Governor admonished that people should know the God they serve. He said prayer is a sign of dependence on God and that if it only a proud man that will not pray. He mentioned examples as Nehemiah, Daniel, Esther and others who prayed in the Bible and that in our time people could still do the same and get result. The Governor welcomed the Church of Nigeria, Archbishop and Primate as well as all-the delegates to Delta State and to Warri in particular and wished them fruitful deliberations. Governor Okowa was accompanied by eminent dignitaries including his Deputy Barr. Otuaro, the Delta State Speaker of the House of Assembly, Commissioners and royal fathers. His Excellency, former Governor of Anambra State and P.D.P Vice Presidential Candidate, Mr. Peter Obi in his good will message commended the Church of Nigeria (Anglican Communion) led by the Primate and Metropolitan and Archbishop, the Most Rev. Nicholas Okoh for the good work God is using him to do in the Church of Nigeria (Anglican Communion). Previous article88.6 MILLION NIGERIANS ARE POVERTY STRICKEN – Bishop Christian Ide.